The Volkswagen Golf GTI is a sporty hatchback that’s both stylish and fun to drive. 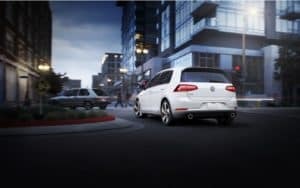 If you’re interested in leasing one and looking for Volkswagen Golf GTI lease deals near Toms River, Brick, and Freehold, check out the selection at Toms River Volkswagen. Apply for a lease today to get started! The Volkswagen Golf GTI is an exciting hatchback that runs on a 2.0L TSI® 4-cylinder turbocharged engine that gets up to 228 horsepower and 258 lb-ft of torque. This powertrain runs with a standard 6-speed manual transmission, but a 7-speed DSG® automatic with Tiptronic® and Sport mode is also available. It lets you take control of the gears with steering wheel mounted paddle shifters. While this compact car is designed to deliver sharp handling, it boasts a roomy interior with 22.8 cubic feet of cargo room and 93.5 cubic feet of passenger space. It also shows off its dynamic style, both inside and out. There are striking red brake calipers on the front wheels of the Volkswagen Golf GTI, while the interior features a leather-wrapped steering wheel with red stitching and a choice between leather seats or Clark Plaid cloth seats with red accents. At the front of this stylish cabin, there’s an 8-inch touchscreen in the center of the dashboard. It’s home to the Volkswagen Car-Net® App-Connect system. It’s Bluetooth®-compatible and lets you sync your smartphone with Apple CarPlay™, Android Auto™, or MirrorLink®. You can also personalize your drive from this screen. It features Driving Mode Selection where you can adjust how your car responds by flipping among five modes, including: Normal, Comfort, Eco, Sport, and Custom. This high-resolution dashboard monitor can even help you check behind you when you’re backing up. Whenever you shift into reverse it’ll switch its display to what the Rear-View Camera System sees. While the Volkswagen Golf GTI is an exciting car, leasing it offers a few unique opportunities. First, you’ll start by agreeing to a lease deal that lets you drive the car for either 24 or 36 months. After your Volkswagen lease ends, you’ll return it to the dealership. That’s when you’ll have a chance to upgrade. 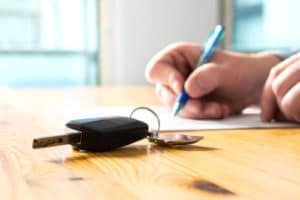 Starting a new Volkswagen lease when you return the car is a quick, and convenient way to get the keys to a brand-new car with all the latest features. It also lets you get some variety in your driveway. The Volkswagen Golf GTI is available in four trim levels and nine different colors, so you’ll have lots of options. Choosing to lease can also save you money. When you buy a car, you’ll need to pay off its full value, starting with a big down payment. With Volkswagen leasing, you’ll only need to make payments during your lease term. So, you usually won’t have to make a down payment before you get the car. Visit Toms River Volkswagen to learn more about leasing the dynamic Volkswagen Golf GTI. We offer a great selection of Volkswagen Golf GTI lease deals for drivers in Toms River, Brick, and Freehold. To get started, contact our finance center or feel free to browse our lease deals online.